A New Map of Present Germany, Shewing Its Principal Divisions, Cities, Towns, Rivers, Mountains, etc. 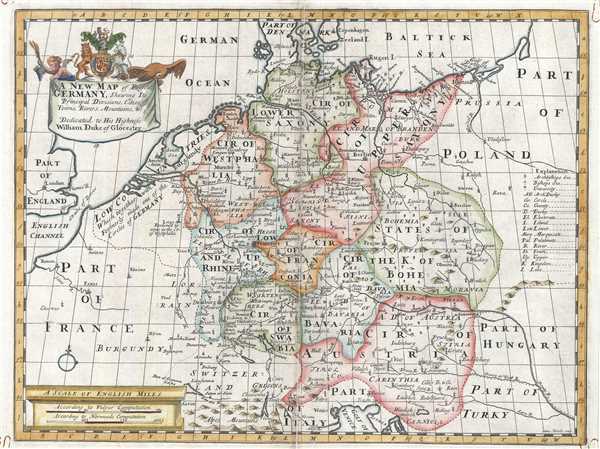 This is a beautiful 1712 map of Germany by Edward Wells of Oxford. It covers the entirety of the lands traditionally occupied by the Germanic peoples, from the Gulf of Venice to the Baltic coast as from Holland to Poland. Notes towns, rivers, lakes and other topographic features. A decorative title cartouche appears in the lower right quadrant. This, like many other Wells maps, is dedicated to Prince William, Duke of Gloucester and son of Queen Anne, who, when this map was being prepared, was a student at Oxford. Engraved by R. Spofforth and published by T. Bonwicke for the 1712 edition of Edward Wells' Atlas, A New Sett of Maps both of Ancient and Present Geography. Very good. Some wear and toning along original centerfold. Damage to centerfold, repaired. Original platemark visible. Professionally flattened and backed with archival tissue. Minor foxing.